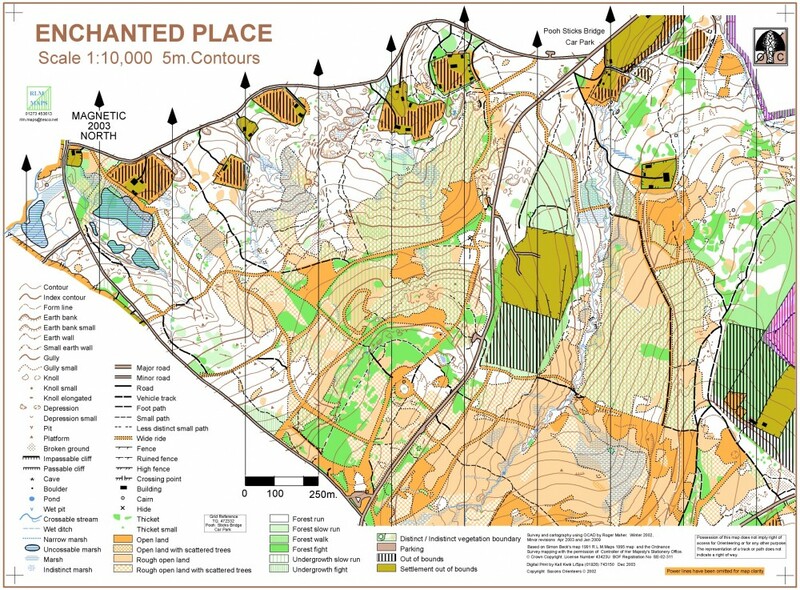 Many of you will already be very aware that regrettably control 45 was misplaced today and many competitors were affected, some considerably so, hence I have carefully considered British Orienteering Rules - Appendix A sections 7.9 and 7.10. The options are to 1) void course(s), 2) reinstate any missing punches so competitors are not disqualified but otherwise let the race results stand or 3) remove legs either side of the misplaced control. Taking into consideration that it is 1) a Level B event, 2) six courses were affected 3) voiding courses would mean a lower number of competitors would count for the Cup and Trophy scores introducing other fairness issues 4) the split times which show that several competitors did not have a time recorded for control 45 and 5) the percentage of each course that would be being disregarded if the legs either side of control 45 were voided, my conclusion is that the fairest and only realistic approach is to remove the leg to 45 and the leg from 45 on all 6 courses affected. The results will be produced on this basis pending any protest; although I very much hope that everyone will accept that the decison to respond to this error in this way is not based on the affect on the competition results and is, after a great deal of advice from the potential jury members, the only sensible response that does not effectively throw away a great deal of effort on the part of the competitors and the organisers which made today such an otherwise fantastic event. I should add that the Controller today concurs with my view. Thank you all very much for coming to the event today. I hope that the above control misplacement did not overly detract from your enjoyment of orienteering in Ashdown Forest today. What a lovely March day! The forest was beautiful despite the nip in the air. Saxons club members arrived very early and everything was in place well ahead of the time it needed to be. Spare club members were on hand if needed and no-one needed to rush. The upfront parking, start team and results planning had been meticulous and each had several iterations before the day. The risk assessment was exemplary. Each of the many Saxons teams led by Graham performed magnificently. All was looking good for a great event as the first starters set off. From my perspective all that changed as the first runner on a long course returned and calmly explained why they thought control 45 was in the wrong place. I heard the number 45 mentioned many times subsequently. I appreciated the forbearance shown by most of you and saw, first hand in the forest, examples of what you had been through as I visited the control site. Many of you must have wondered “How did the Controller miss that?” It’s a question I have asked myself repeatedly. I controlled my first event in 2002 and have controlled more than 40 events since then. Yes, I have had disappointments previously but nothing on the scale of this. There were a few small contributing factors which gathered together and contrived to wrestle me to the ground but the necessary deep concentration at a key moment must have been lost. David put in a tremendous amount of work identifying the necessary course lengths, developing your courses and putting out all the controls over 3 days in very testing weather conditions. I was delighted to hear so many positive comments about the courses at the finish despite your obvious frustrations and this was well deserved. I can only apologise to David, the rest of Saxons and to you, the competitor, for letting you down. It was inevitably a rather lonely feeling as the event gradually wound down and I greatly appreciated the support from others. Ashdown Forest, as many of you will know, is a very special place. It is managed by the Board of Conservators of Ashdown Forest, an independent body. In recognition of the ecological importance of Ashdown Forest and to ensure its protection, it is designated as a European Natura 2000 site and as a Site of Special Scientific Interest under UK legislation. Ashdown Forest is also within the High Weald Area of Outstanding Natural Beauty. The Conservators are keen to raise the public’s (and hence our) awareness of their legal duty and, within this, their aim of balancing the interests of all users of the forest. Please have particular regard therefore to the other users of the area, including all walkers, dog walkers and riders, all of whom are also seeking to enjoy their activities peacefully. Slow to a walk, keep especially quiet and keep a wide berth at any point where you meet horse riders. What Price This Magical Place? Imagine you were offered lifetime admission to a vast, enchanting park – a place where paths wind through woods and slopes, past streams, waterfalls, hidden gardens and magnificent views, a place whose wildlife and landscape can set your spirits soaring. Most of us would probably be willing to pay a small admission charge for all this wouldn’t we? In fact there’s no charge to enjoy Ashdown Forest – which at the moment offers all these things and more – and there won’t be. But if you’d like to keep the forest the way you love it the time has come to consider making a donation for its upkeep. The reason is simple – the forest is losing public grants of £60,000 which help pay for its maintenance – from clearing up fly-tipping to cutting back dangerous roadside trees and from keeping car parks in good order to managing livestock. So unless the guardians of the forest, the conservators, can raise this money elsewhere the forest will start to lose some of its shine. 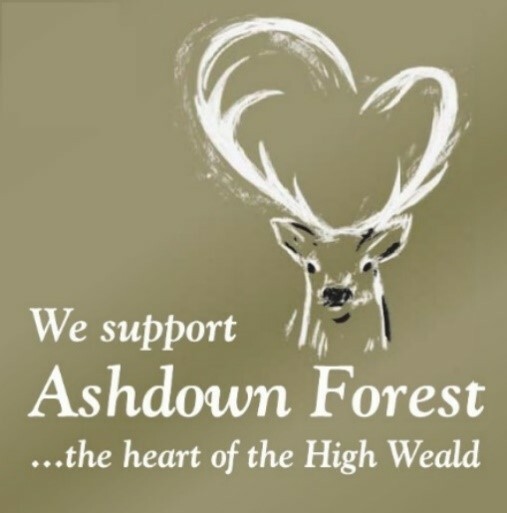 That’s why they are now urgently appealing for donations from everyone who appreciates and enjoys the unique qualities of Ashdown Forest. Whether you are an occasional stroller or a regular dog-walker, a horse-rider or a nature-watcher, a picnicker or someone who scampers across the forest with the kids – please pause and think whether your life would be worse without it. And if the answer to that question is yes, why not donate? Even small contributions of a few pounds will be warmly welcome. There are a million visits to the forest each year and if each one resulted in a gift of just six pence it would close the funding gap the forest is facing. Alternatively, the new 2019 Ashdown Forest car window sticker is now available on our webpage in Bronze, Silver and Gold. There’s a vast range of work the conservators and forest staff do to keep it at its best. That includes emergency help such as attending road accidents and deer collisions as well as the preservation and enhancement of the forest’s walks, rides, car parks and open spaces. Donations have begun coming in from friends and supporters of the forest – please do take a moment to contribute if you’re able. It’s your ticket to enjoying Ashdown Forest forever. The event centre will be at the southern end of the mapped area close to the junctions of the B2026 and Kidd’s Hill Road south of Hartfield (between Forest Row and Groombridge). We have recently been given permission to use the summer car park at Gills Lap North as our main car park, which is adjacent to the assembly area and start and finish. This car park is at TN7 4EU. Car parking will be spread across 2 car parks. Please can all competitors help by sharing cars as much as possible. The furthest car park will be at Four Counties, High Road car park at TN22 3JD from which there will be a 600m taped walk across open land (away from the road), but with one minor road crossing, to the Assembly Area and a further 200m walk to the Start. The Finish will be adjacent to the Assembly Area. A clothing dump will be provided. Registration/enquiries/SI card hire pick-up will be at assembly adjacent to the Gills Lap car park. Start times for CS Cup and Trophy will be preallocated. If you miss your start time you may have a long wait before you can be slotted in. There will be two starts; one for CS Cup and Trophy competitors and one for colour coded courses. Both starts are c 200m from assembly and close together. The finish is adjcent to assembly. A Start official will carry out an SI dibber Check – this is important to ensure SIAC cards are switched on. Please arrive in time for your allocated Start – to have a start time changed you will need to visit Enquiries to get a card showing your revised time, for presentation at the Start. Start times will not be re-allocated by the Start officials. The Non-CompassSport courses (White, Yellow & Light Green) will have a separate Start, adjacent to the main Start. ‘The Enchanted Place’ is the eastern part of Ashdown Forest; named by association with the fictional teddy bear, Winnie-the-Pooh; created by A.A. Milne, the British author and playwright; and the adventures Pooh and his friends had on this part of the forest. We hope you enjoy your ‘adventures’ here! The area has been professionally resurveyed and redrawn by Dave Peel in Spring 2018. Minor planning updates early 2019. It is A3, 1:10,000 scale, 5 metre contours, ISOM2017, overprinted and waterproof. This part of Ashdown Forest has lots (lots) of ‘lumps and bumps’. The mapper has, fortunately, not attempted to map everything, but to concentrate on the larger features and ‘use contours to show how land forms are not isolated features but are inter-connected, giving a clearer picture of the terrain’. There is one non-IOF symbol used on the map - a small brown triangle to represent a platform. The White course uses the same control as both no.1 and later as no.6. Please ensure that competitors on this course are aware of this. Roads: all roads and grass verges along roads are out of bounds (except at crossing points) and are marked so on the map by a purple X.
Fences/forest management: over recent months, the Conservators have erected electric fences around three large areas of heathland, to provide cattle grazing as part of their forest management. Some courses run along side this fencing, but no courses require entry into these areas. On no account should these fences be crossed or touched! Within the fenced areas (and elsewhere) there has been some forest management resulting in clearance of gorse. The fenced areas have not been re-mapped, but elsewhere, in the location of control sites, the map has been updated. Forestry management is ongoing and any issues relevant to courses will be displayed at the start. Control descriptions: will be on the map. Loose control descriptions will be available at the start. Punching: SIAC wil be enabled for this event. In the event of failure of a unit please use the pin punch attached to the unit to register your visit. There will be boxes marked on your map for this purpose. Naughty numbers: there will be a free 'naughty numbers' course for juniors in the copse near the finish. Courses close at 14.30. Please ensure you have downloaded before you leave the area. Safety bearing if lost: South to road and then to Assembly Area. All competitors must have full leg protection. Participants will be required to carry a cagoule if weather warrants this. Lone competitors will be able to leave car keys at Registration in Assembly. The competition map will have an emergency phone number (for the organiser). The JK closing date is Sunday 24th March. If you have not yet entered, don't forget to do so in the next few days. CS Cup and Trophy entries are via club captains only. Full details have been e-mailed to club captains. There will no Entry on the Day for these courses. For non CSC competitors there will be Light Green, Yellow and White courses available which will be Entry on the Day only. The western part of the area is on a north facing downward slope and comprises a mixture of mainly beautiful runnable woodland and rough open heathland containing a variety of features. The larger eastern part is on an east facing slope down to a river valley with an upward slope to the east and south. The open heathland consists of gorse, heather, some bracken, tussock grass and marshy bits. Generally, runnability may be reduced in places by the tussocks, heather, marshes and gorse. The marshes are generally very slow with large tussocks. The area has extensive gorse cover and large ‘thickets’ have been well mapped with the ‘fight’ vegetation screen. The Planner has attempted to keep courses largely in the woodland and use the best parts of the heathland, though the longest courses, especially, will encounter some of the more ‘challenging’ terrain. In the woodland, hides appear and disappear regularly. These are not mapped, save for one built by the Planner which serves as a control feature (denoted on the map by a black x). If the period leading up to the event is particularly wet, some ground features such as pits and depressions may contain water and appear as wet pits/depressions/ponds. CLUB TENTS OR BANNERS WILL NOT BE PERMITTED BUT THERE IS A WELL DRAINED SHELTERED COPSE ADJACENT TO THE ASSEMBLY AREA WHERE COMPETITIORS MAY WISH TO SHELTER FROM ADVERSE WEATHER. Portaloos will be situated in Gills Lap car park. Dogs are allowed in the car park and on the event area, but must be kept on a lead at all times as the area is heavily used by horse riders.